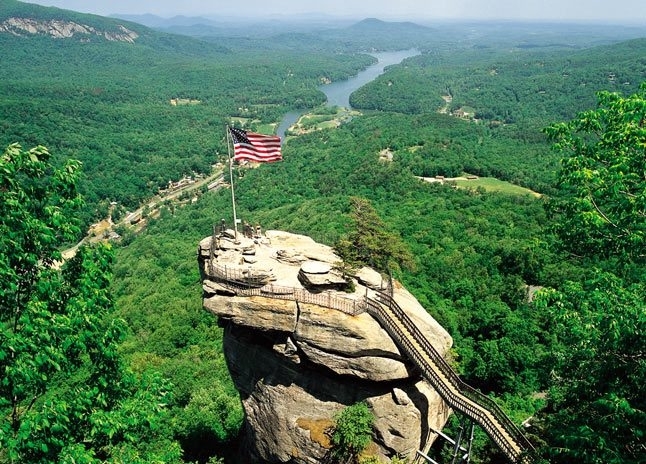 From the top of Chimney Rock you'll see 75-mile panoramic views of Hickory Nut Gorge and Lake Lure. The Park features mountain hiking trails for all ages and abilities, including the Hickory Nut Falls trail to the 404-ft. waterfall, and the Four Seasons trail to the Meadows. The Great Woodland Adventure features 12 discovery stations with locally-made sculptures of the animals found in Chimney Rock. The Skyline trail takes you to the highest peak in the Park, Exclamation Point.